One word crops up all over the place: "Humiliation". Huffpost UK uses it in its headline, but goes on to say that Wednesday's Commons Brexit defeat for Theresa May is "a frustration, an embarrassment - but not a fatal blow by any means". According to The Daily Telegraph, the Tory rebels have left the prime minister in an exposed position as she travels to a crucial EU summit in Brussels. The Daily Express talks of an eruption of Tory warfare over Brexit. It calls the rebels "stubborn" and describes their behaviour as "outrageous". The Daily Mail dubs them a "coalition of the disgruntled" and its columnist, Quentin Letts, accuses them of cooking up ruses to "keep us mired in the EU gluepit". The Sun calls it a "day of dismay". For the Daily Mirror though, it was a "good night for the sovereignty of Parliament" in which the House of Commons voted to take back control of Brexit. Another political upset comes in for much analysis, this time in the US. 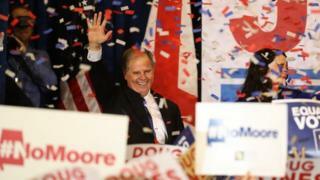 According to the Guardian, the Democrats' "stunning victory" in Alabama means they can "dare to dream" - it raises the prospect that the 2018 mid-term elections could seriously shift the balance of power. The Times thinks the result may show Donald Trump that his grandstanding carries an electoral cost. A column on the Politico website says Mr Trump's setbacks at the polls since taking office have so far been very similar to those suffered by Barack Obama. And, like Obama, Trump could be re-elected - while his party is decimated underneath him. Several papers highlight a report which, according to The Times, suggests that "work-shy millennials" are "adding to NHS staff pain". A reluctance by younger people to work full time, the paper says, is contributing to a "workforce crisis". The training body, Health Education England, says it means the NHS will need to hire 190,000 extra frontline staff - or embrace radical reform. According to The Telegraph, the report warns that the NHS needs to take account of the rising number of health professionals "who see flexible working and career breaks as a right". The Sun claims to have smashed a multi-million-pound plot to "fix" the third Ashes cricket test. One leading sports writer tells the paper: "This is bombshell stuff and potentially disastrous for the game". It spreads the details over the front and four inside pages - and says its dossier is being looked at by the International Cricket Council (ICC). The ICC last night issued a statement saying there was no evidence the third Ashes Test in Perth had been corrupted. Street lights could one day be replaced by glowing trees, according to The Telegraph, after scientists discovered how to make plants shine in the dark. Researchers at the Massachusetts Institute of Technology have proved it is possible to inject the chemical used by fireflies into leaves so that they shimmer brightly. They have already managed to get watercress to give off enough light to read a book.